Seeing as that many layout changes are useful as a learning point for other people. For example having a layout file listed here that has in it how you can display the info from the unit Info Panel at another location onscreen might be useful for other people. I figured why not create a sort of database of example layout files which change specific parts of the UI or perhaps even the entire UI. If you want to share your SC2 UI with other people this is the place to do it. and finally as an attachment the SC2Layout file (and perhaps the screenshot example). As I said earlier there are 2 types of snippits, complete UI change snippits or partial UI change snippits, therefor I will keep these in seperate Tables of Contents so that it is easier to find the snippit you want. This SC2Layout File will cause the CommandCard to become a size of 15x1 instead of 5x3. and it adds a border around the CommandCard. Screenshot of the effect in the attachments below. more of my own layout files to follow, since I have a collection at home of the once I use :) sadly I'm at work atm so I don't have enough time to post them. The only snippet here doesn't seem to work anymore, are there any that have been tested with the new stuff? Just checked, the snippet still works. Added test map to show that it works, and how it is added. Hey not sure if this belongs here, but here's a UI I'm sharin with all the lovely people. Be sure to disable the Console panel on startup, removes all the UI fluff, repositions the command bar right beside the display, hides the last 5 command buttons (might be bad for some people, but it lets me keep all the hotkeys without showing the abilities, for the base commands like stop and such) then repositions the inventory bar right above the command bar, puts both tooltips right above the bars, relocates the chat to the far left instead of the center. Hides minimap buttons as well. This layout puts the last 10 buttons of the command card in a single row at the bottom center, and adds a background frame. Then it resizes the inventory buttons, centers them above the new command card, and adds a background frame for the inventory. The first 5 buttons of the command card, which are not visible in this interface, have been moved offscreen but maintain their functionality and can still be activated via hotkey. 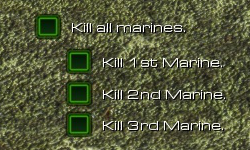 These files get rid of the "Main Objectives" and "Bonus Objectives" text. They re-organize the objectives so that secondary objectives are indented, and are beneath the primary objective(s). This is useful if you want your secondary objectives to be prerequisites to completing a primary objective. Import all three files, including the dds (needed to remove the arrows). Don't change their names unless you want to do some code editing. If the order makes any difference, add ObjectivePanelIndented to the Custom Layout Files field first, then ObjectivePanelOverride second. ObjectivePanelOverride is a traditional GameUI override file. All it does is points to a template in ObjectivePanelIndented, so that the deep changes can be made. I've also included a test map. Enjoy! The download attachments don't work any more :/ Could you post the snipet text?? Commandpanel 1x15 is in the spoiler below. You can copy this into a new layout window that you can create in the UI editor. Also know that the 1x10 example shown above the first 5 buttons are not available onscreen.